When most people think “Hollywood” the first thing that probably comes to mind is “Hollywood glam”—celebrities, mansions, fame, and fortune. My fascination with it, however, began with “Hollywood grit”—rock n roll, broken dreams, and, of course, its many haunts. For every yin, there is a yang. For every light, there is darkness. 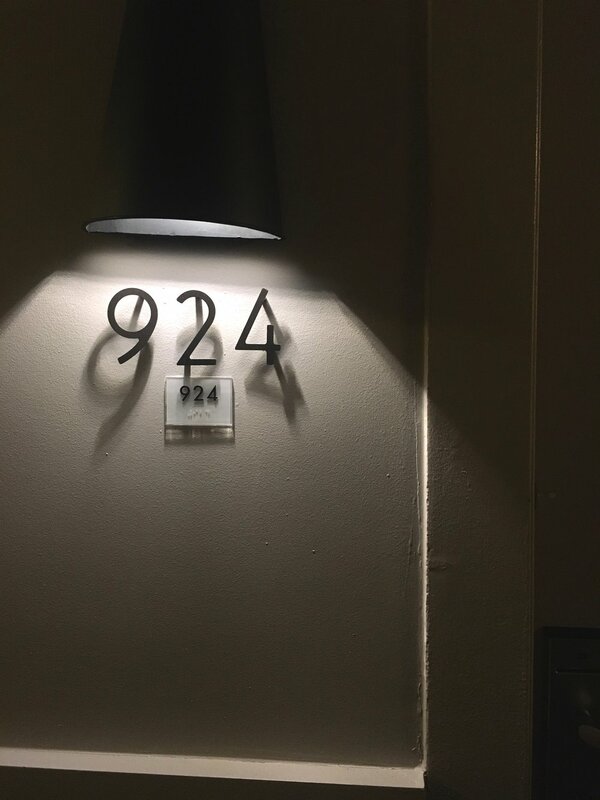 When I visited Los Angeles this past July, I was completely in search of the “yin.” And what better way to begin that search than to stay at one of the most haunted hotels in the world? I’d arrived at the Hollywood Roosevelt, just as the sun was about to set on Hollywood Boulevard. Was it metaphorical of my discovery of that "darkness" I was looking for? ...Probably not, but we can pretend. Side note: I’m probably going to be saying “Hollywood” more times than I have in my entire life combined in this article. If you get bored—or are just extremely observant, you can count the number of times I say it and send me your total. Deal? I instantly snapped about 30 photos before my family and I even parked the car in the lot... I’ve seen the iconic Hollywood Roosevelt sign in just about every paranormal documentary TV show I’d ever watched, and now, I was seeing it in person! The Hollywood Roosevelt opened its doors in 1927 and has had many notable residents pass through its doors, including: Charlie Chaplin, Clark Gable, Ernest Hemingway, Prince, Angelina Jolie, F. Scott Fitzgerald, and a countless number of other classic and modern celebrities. Many events have taken place at the Hollywood Roosevelt, as well. The first two Academy Award banquets took place in the hotel's ballroom. Shirley Temple also learned her well-known stair dance routine on the hotel staircase, and Marilyn Monroe's first commercial photoshoot took place poolside at the Roosevelt. In fact, Marilyn Monroe lived at the Roosevelt for two years at the start of her career. 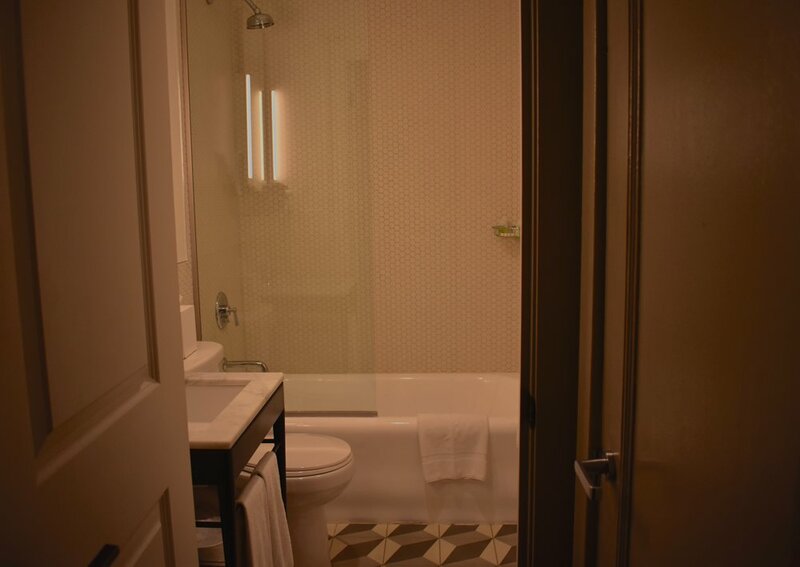 She stayed in Suite 1200, now known as 'The Marilyn Suite' where Monroe's ghost has said to be spotted in the full-length mirror located in the room. The mirror has since been moved to the lobby. The bellhops kindly took our bags and escorted us to the lavish lobby. A large, dimly lit chandelier hovered above us. I, not having too much luxury hotel experience, had to admit that I was feeling a bit of that “Hollywood glam” for a moment. My excitement and apprehension were beginning to grow, and I hoped that I wouldn’t regret walking through the doors later. It could have been because someone packed their bags and dashed after seeing an apparition or because the hotel staff was simply being courteous, but as the kind receptionist was checking us in, she informed us that we would be receiving a room upgrade, and handed us our room key. I audibly gasped and mumbled “Floor 9...” to myself. “I’m guessing you know all that history surrounding the 9th floor,” she commented, letting out a soft chuckle. humor to mask the fact that I was (excited, but) terrified. My apprehension meter had just about reached its limit as we rode the elevator up to the 9th Floor. The music on the elevator wasn’t making it any better, either. It wasn’t your typical elevator music—it sounded dismal, and almost warped in a way. I could barely make out what kind of music it was, and I still couldn’t explain it if I tried. I just know that it was incredibly unsettling and otherworldly, and it stuck with me. We eventually exited the elevator, and I dashed as quickly to the room as I could while dragging my packed-to-the-brim suitcase. I ran a few tests with the bathroom lights, but they never turned on by themselves again after that. After all my research, I’m still not sure if the lights at the Roosevelt are motion sensored in any way or not. ...And part of me is glad that I don’t know. Writing about my final encounter, later that night, is giving me goosebumps. My mother and I were headed to the Hard Rock Cafe for dinner, so we entered the elevator on our floor to head down to the lobby. There was only one other person on the elevator: a man who caught my eye immediately, because he was dressed in bright white clothing from head to toe, and not just regular white clothing, either... This man was wearing a white tux, with white shoes and a white top hat. Living in the New York City area, I’m used to eccentric styles, so my astonishment wore off rather quickly. Practicing my “elevator etiquette,” I asked him if he was going up or down. He reacted strangely, with a simple nod and smile. I politely smiled back, and pressed the button to bring us down to the lobby. We exited; he did not. My search disproved my theory—hard... Not only is a white tux not any type of uniform at the Hollywood Roosevelt, a man in a white tux is one of the hotel’s reported ghostly sightings. Reading this, my blood went cold and I shouted “OH, MY GOD.” about a dozen times. Could this have just been a man wanting to get dressed up for the day? Very likely. Could this have been a ghost from Old Hollywood, still roaming the place that once gave him the best days of his life? Also very likely. 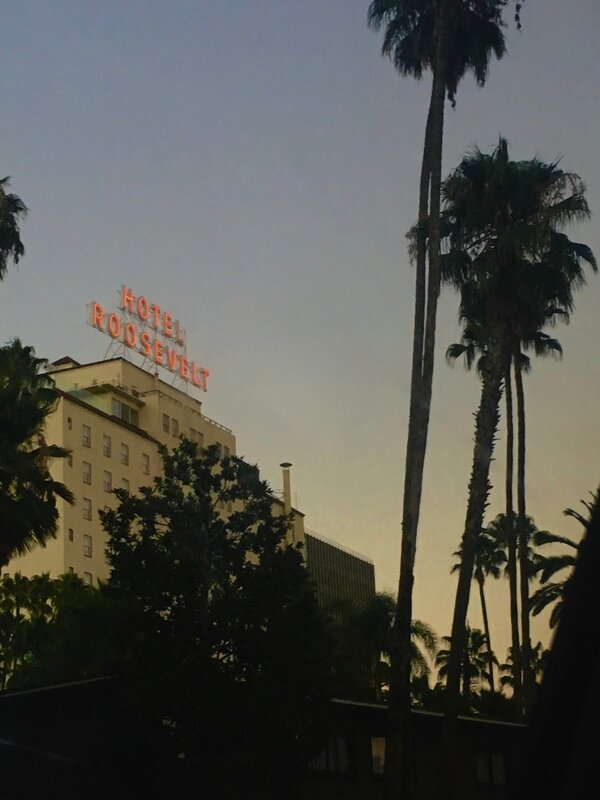 Before visiting the Hollywood Roosevelt, I had barely any experiences that could even be confused with ghostly encounters. I left the hotel with three. And while my experiences at the Roosevelt (especially the one on the elevator) were unsettling, I’m glad that they happened. I mean, what was I expecting when I decided to visit a hotel, famously known to be haunted? Additionally, I felt no negative or malicious vibe in the Roosevelt at all. Whatever spirits may be lurking that hotel are good spirits in my book—well-dressed ones, at that! If I was a Hollywood star, I wouldn’t want to pass on, either. So thanks for letting me visit, Hollywood Roosevelt... And for not stealing my Kat Von D contour palette. During my time in Los Angeles, one of my must-see stops before leaving was The Museum of Death. The Museum of Death is located on Hollywood Boulevard and was founded by J.D. Healy and Catherine Shultz. The museum is an approximately 45-minute self-guided tour of all things dead, creepy, and disgusting—not quite the traditional fine art museum we’re all used to seeing, but better! We were immediately greeted by a beautiful skull painting outside of the building and a sign reading “Museum of Death: Where Stars Go To Die,” then a red-eyed gargoyle fountain with a red LED sign above reading “DEATH IS EVERYWHERE” in the front entrance. The scene was set from the beginning! The staff was very warm and welcoming (a complete contrast to the museum’s content itself). No photography was allowed inside the museum, which you should probably be thankful for—this place was gore central! Everything in the museum had paragraph-or-so descriptions next to it, immersing you and making you cringe even more. As a lover of slasher films and all things bloody disgusting, I had the time of my life (or death?). After the gentleman working the front desk gave us a few guidelines, we entered through a curtain and were immediately presented with a room covered inch-to-inch with clown art, letters, and glass-encased objects, among other displays. I realized quickly that most of the room was content relating to John Wayne Gacy—you know—that “Killer Clown” who murdered dozens of teenage boys in the ‘70s and makes Pennywise the Clown look like a saint? My mother let out a subtle “Ugh!,” and I had to admit, I was feeling the same way. Our stomachs were turning within seconds—exactly what I had come for! Each room in the museum is dedicated to a specific subject. Up next was an execution-style room with various death and torture devices. What stuck with me the most was the electric chair display and next to it, the shirt of a man who received execution by electric chair, stained with...bodily juices of some kind…? Now it was my turn to let out an “Ugh!,” only not as subtle... Another highlight was the head of French serial killer Henri Landru who was guillotined for his crimes. It’s not every day that you get to see a severed head from the 1920s. We passed through a surprising variety of crime scene photos and memorabilia. Among the most cringeworthy was a set of photos depicting a woman donning a sweet, joyous smile. It seems normal until you realize that she’s holding a saw and kneeling beside the corpse of her dead and mutilated former lover whom she murdered. The photos were taken by her new lover who then joins the woman in posing naked next to the corpse—not your typical couples photoshoot, now is it? Another highlight was a small section dedicated to cults. Among them, the Jonestown Massacre. The cult began as The Peoples Temple in the US, and eventually migrated to a reclused settlement in Jonestown, Guyana. What followers thought would be a utopia became an incredibly controlled environment from which people could not leave. In 1978, once the US government was informed that their people were in danger, cult leader Jim Jones convinced his followers that they were "under attack," and must commit the “revolutionary act” of suicide. This resulted in over 900 people knowingly (except for the babies and children who were forced) consuming a grape Kool-Aid substitute poisoned with the likes of cyanide and Valium, making it the the largest mass suicide in modern history. This is where the well-known phrase “Don’t drink the Kool-Aid,” (essentially “Don’t be a follower.”) originated from. Nearby was a way-too-accurate replica of the 1997 Heaven’s Gate mass suicide, complete with one of actual bunkbeds found at the scene, a dummy wearing the exact uniform and purple cloth that every member was wearing at the time of their death, and the actual cult recruitment video playing on a television near the bed. I was fixated on it for quite a while, so I’m thankful that I wasn’t brainwashed... The video itself is pure nightmare fuel! The 38 members who committed suicide were under the impression that if they could leave their “bodily containers,” their souls would be able to board a supposed alien spacecraft that was trailing the Hale-Bopp Comet. This group also consumed a poisonous fruit concoction, only instead of Kool-Aid, they ate poisoned applesauce and washed it down with vodka (ironic, seeing as their leader’s name was Marshall Applewhite)... And if you wanted extra goosebumps, their website is still live: www.heavensgate.com. I reached the end of the museum to find my mother sitting and waiting, looking like she’d died and come back to life herself—it was very apparent that we was disturbed, nauseated, and would be telling me how much she hated me for the rest of the day. I know she’d only gone there because I wanted to, and wouldn’t be surprised if she was waiting at the end the entire time. I still laugh at the thought of her expression. Believe it or not, I only skimmed the surface of what the Museum of Death has in store… If you want to be buried six feet under in all things deadly, enter at your own risk! After talking to my mother briefly, I realized this final room was set up exactly like a funeral parlor, with a coffin in front and chairs set up in a funeral fashion. There was also a big screen set up, playing the film Traces of Death, and a massive taxidermied pig, once the live pet of the museum’s owners. I could not think of a cheekier way to end the deadly journey I had just finished. Well played, Museum of Death! Well played. It was August 8, 1969 when four members of the Manson family—Tex Watson, Susan Atkins, Linda Kasabian, and Patricia Krenwinkel—were ordered by cult leader Charles Manson to enter the home at 10050 Cielo Drive and to “totally destroy everyone in it as gruesome as they could.” Living in the home at the time were married celebrity couple, director Roman Polanski and actress Sharon Tate. Polanski was working on a film in Europe at the time of the murders, but four friends were visiting Tate at home that night. Shortly after midnight, Watson climbed up the residence’s telephone pole, cutting the phone line and terminating all telephone access. The gang parked their car down the hill, trekked back up, and broke into the property. At that time, 18-year-old Steven Parent, who had been visiting the property’s caretaker, was leaving the location in his car. Watson ordered Parent to halt, drawing a gun at him. Parent pleaded for his life, claiming he wouldn’t say anything if he was let free. Watson slashed Parent’s palm with a knife, severing his tendons and tearing the watch from his wrist. He then shot Parent to death in the chest and abdomen. 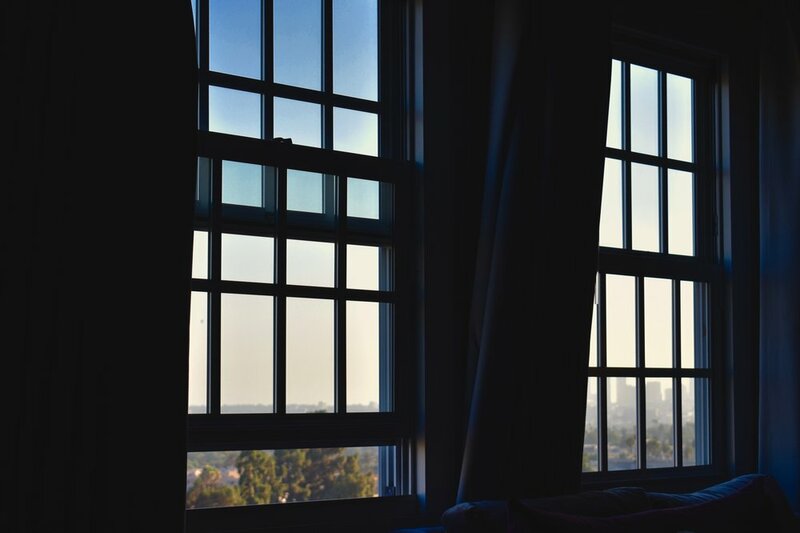 Afterwards, the four killers broke into the home through a window, waking up Tate’s friend, Wojciech Frykowski. Watson kicked Frykowski in the head and when Frykowski asked him who he was, Watson responded, “I’m the devil, and I’m here to do the devil’s business.” The women forced the house’s three other occupants at the time—Frykowski’s lover (and heiress to the Folger coffee fortune) Abigal Folger, Sharon Tate, and Tate’s friend/former lover Jay Sebring—into the living room. Watson tied together the necks of Tate and Sebring, slinging the rope over one of the ceiling beams. When Sebring began to protest the rough treatment of Tate, who was 8-and-a-half months pregnant at the time (making the story all the more gruesome), Watson shot him, then stabbed him 7 times. Frykowski freed himself from the towel his hands were bound with, then made his way onto the porch. Watson caught up with him, striking him over the head with his gun multiple times, stabbing him repeatedly, and shooting him twice. Frykowski was struck so hard that Watson broke the right grip of his gun in the process. Folger also made an escape, but was caught by Krenwinkle, who stabbed and tackled her. Watson then grabbed her as the killers stabbed her a total of 28 times. At this time, Frykowski was hanging on for life and making his way across the lawn. Watson finally murdered him, stabbing him 51 times. Inside the house, the pregnant Tate pleaded to live long enough to have her baby, even offering herself as a hostage in hopes that her baby would have a chance to live. Her pleas were to no avail, and she was stabbed to death 16 times. According to Watson, as Tate was being killed, she cried: “Mother… Mother…”. The killers were ordered by Manson to “leave a sign” at the site of the murders. Using the towel they had used to bound Frykowski, Atkins wrote “PIG” on the front door of the home with Tate’s blood. I’ll admit that I didn’t know too many of the gruesome details until doing research for this particular piece, and it now I feel pretty awful… For some reason, though, it’s the human condition to be fascinated with serial killers and why they do the things they do. We found the address online and asked Siri (the iPhone bot who somehow knows everything) for directions. Upon reaching an estate blocked entirely by a gate, Siri informed us that we had reached our destination. It surprised me how close it was to the center of Hollywood. To think that there could have been people partying in Hollywood just minutes away at the exact time this family was being massacred is chilling to think about. We drove around for minutes, even entering the address into the GPS again. Once again, it brought us to the location it originally brought us to. We noticed a vacant, fenced off area next to the house. Was that the actual location? A quick internet search confirmed that 10066 Cielo Drive was, in fact, the location where the murders took place. Trent Reznor of Nine Inch Nails was actually the last person to live in the original home. He began renting the house in 1992 and set up a recording studio there that he named ‘Pig’ (in reference to the bloody message left by the Manson family). Much of NIN’s 1994 album The Downward Spiral was recorded in this studio. Upon meeting and having an eye-opening conversation with Tate’s sister, he realized that the history was simply too heavy for him to handle, and ended up selling the home. In 1994, the building was demolished, rebuilt to look entirely different, and the property’s address was officially changed from 10050 Cielo Drive to 10066 Cielo Drive. Los Angeles is an incredibly beautiful city and believe me, the “Hollywood glam” is alive and well. But knowing some of the spooky history that lies in the Hollywood Hills and surrounding myself with it gave me goosebumps on a 100 degree day, and I had to listen to cheesy show tunes every night to put myself to sleep. I got exactly what I wanted, and I do hope whatever souls still lurking amongst the stars find whatever it is that they’re looking for. I think finally realized what The Weeknd meant when he said “The Hills Have Eyes."